I believe her. I cannot imagine what sort of man-made hell (quite literally) she is now living through wherever she and her family are in hiding. I like to think of them as the trees pictured here are doing—embracing and supporting each other. From an ocean away, I can at least virtually support her. I am, of course, referring to Dr. Christine Blasey Ford and her forced-to-go-public allegations of sexual assault as a 15-year-old at the hands (and body) of Trump-supported Supreme Court nominee, Brett Kavanaugh. Trump, and many male Republican senators, have publicly called Dr. Ford a liar. Would we expect anything different, anything better from men who excuse their own misogynistic beliefs and behaviors as mere locker-room boorish boy banter? I do understand the long-lasting negative effects of surviving sexual assault. I understand the power of love, support, (good, woman-centric) therapy, time—and of telling one’s own story if and when one is ready to do so and when one is ready—in healing, in survival, in resilience, in endurance. In, as is used well in Indigenous Studies, survivance: survival/endurance or perhaps survival/resistance. I wish for Dr. Ford and other brave girls and women in the world survivance and goddess-speed. This week’s New Yorker article by Kathryn Schulz, “The Really Big One”, about my beloved Pacific Northwest’s vulnerability to a devastating mega-earthquake and tsunami, has stirred a lot of debate and fear here in my hometown of Seattle. There’s been a run on the buying of ready-made disaster preparedness kits. Companies doing seismic retrofitting of houses are now booked out almost a year. As the article states, scientists report that we are overdue for a large or mega earthquake (9,0) and tsunami (100-ft) that will kill at least 13,000 people, injure 27,000, displace 1 million people, and destroy two-thirds of all hospitals. Everything west of Interstate 5 will be destroyed. It is clear that our government entities, businesses, hospitals, schools, fire departments, need to do much more to prepare for this disaster. As individuals we can support legislation to require better community-wide disaster preparedness (and support ways to actually fund these measures). As individuals we can heed the public health disaster preparedness advice and keep adequate disaster kits in our homes, school, and worksites. In a previous blog post titled “Be Very Afraid” (November 22, 2014) I wrote: “Or be at least a little bit afraid: not so afraid that you become paralyzed with fear and not so little afraid that you don’t do practical things to better prepare yourself (and your family) in case of disaster/emergency. Aim for being ‘just right’ afraid.” And I recorded the items I collected to make our family’s disaster/emergency preparedness kit–along with the realization that disaster preparedness is not an equal opportunity affair. But something I have learned from my colleagues in New Zealand who work on post-Christchurch earthquake recovery efforts, is that an equally important part of disaster preparedness at the community level is promoting community resilience and wellbeing. More closely-knit communities–regardless of economic resources–tend to weather disasters better than others. Several of the Christchurch-area Maori marae (communal, sacred land/communities) organized to take in and provide food and shelter for foreign students and visitors affected by the earthquakes before any official government-sponsored program was able to do that. This isn’t to gloss over the very real socio-economic and racial disparities highlighted by ‘natural’ and man-made disasters. The lessons on this from Hurricane Katrina in New Orleans stand as reminders. 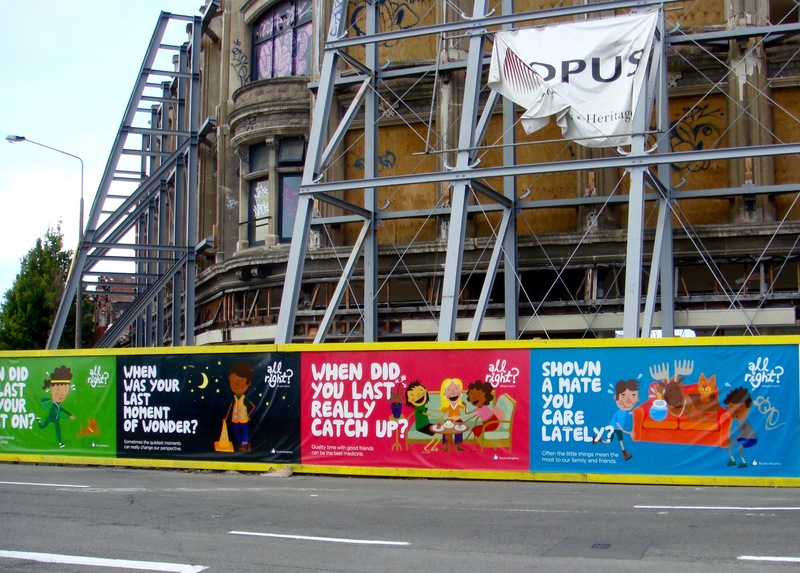 I was somewhat skeptical when I first encountered these bright, up-with-people banners (shown in the photo above) I saw in the midst of the still fresh earthquake devastation in the downtown core of Christchurch in 2014. But as I focused more on their messages, I realized they were all about building individual and community resilience. They are part of the All Right? Campaign, a Healthy Christchurch initiative of the Canterbury District Health Board and the Mental Health Foundation of New Zealand. They based their campaign on the work of the UK-based social, economic, and environmental justice think tank, The New Economic Foundation, which developed the evidence-based Five Ways to Wellbeing (with a Kiwi slant below). Now these are some excellent ways to prepare for the Big One. Connect… With the people around you. With whanau, friends, colleagues and neighbours. At home, work, school, or in your local marae, church or community. Think of these connections/relationships as the cornerstones of your life and invest time in developing them. Building these connections will support and enrich you every day. Be active… Exercising can make you feel good! Step outside. Go for a walk or run. Cycle. Play a game. Garden. Have a boogie or do some kapahaka. The most important thing is to find a physical activity you enjoy that suits your mobility and fitness. Do it with friends or whanau and you’ll be ticking two boxes… connect and be active! Keep learning… Try something new. Rediscover an old interest. Sign up for that course. Take on a different responsibility at work. Fix a bike. Learn Te Reo or how to play an instrument or cook your favourite food. Set a challenge you enjoy achieving. Learning new things will make you more confident as well as being fun. Give … Do something nice for a friend, or a stranger. Thank someone. Smile. Volunteer your time. Join a community group. Look out, as well as in. Seeing yourself, and your happiness, as linked to the wider community can be incredibly rewarding and creates connections with the people around you. Aroha ki te tangata, a Maori saying meaning respect for/goodwill towards others. New Orleans Bottle Djinn: Stealing Stories? New Orleans, Louisiana, French Quarter, May 2014. Part II. How do people deal with and bear witness to trauma? How have the people of New Orleans collectively chosen to remember Hurricane Katrina? As I wrote in my previous post “Collective Sites of Memory: New Orleans” (3-28-15), those were some of the questions I was pondering last May as I returned to New Orleans for the first time since Katrina. Having visited–and been disappointed by–the Katrina National Memorial Park in New Orleans, I decided to visit the permanent exhibit “Living with hurricanes: Katrina and beyond” located at the Presbytere Louisiana State Museum in the heart of the French Quarter. Greeting me in a wildly disorienting way as I entered the main door of the museum building, was the art installation shown in the photos above. 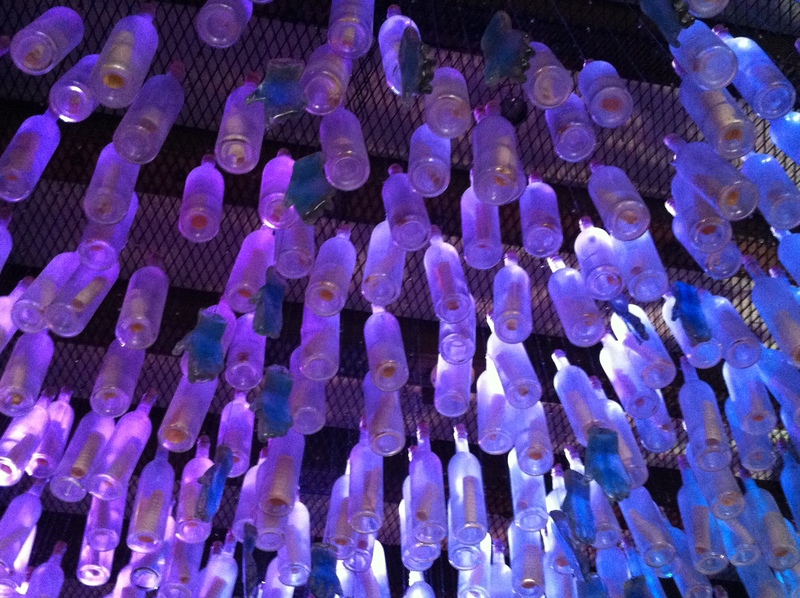 Hundreds of ‘floating’ glass bottles with messages curled up inside them, all hanging from the ceiling. 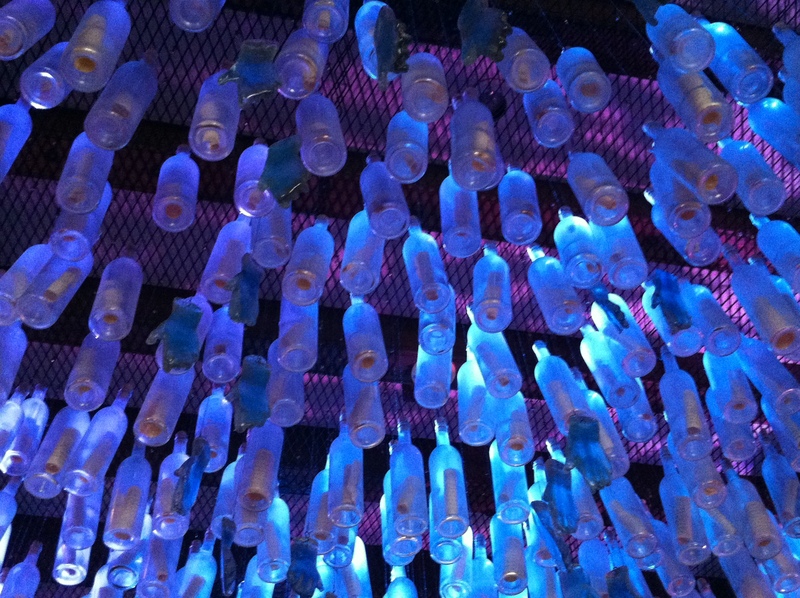 Interspersed among the bottles are ghostly blue glass hands, reaching down–or wait! are they reaching up out of the deluge, the person attached to the hand drowning and asking to be rescued? I stood in the middle of the foyer gazing up at the display as the lights surrounding them gyrated from blue to purple to pink to red and back again–trying to figure out which way was up and which was down in this display. Who are the rescuers and the rescued? It felt as if I was simultaneously the rescuer and the rescued—floating in the midst of the primordial sea of life. The brightly-colored bottle display also reminded me of that uniquely Southern folk art of bottle trees, shown here in a classic black and white photograph by the venerable writer (and WPA photographer) Eudora Welty. The folk belief is that placing bottles on trees away from the main entrance to the house will help to capture and repel ‘bottle genies’/djinn/or ‘haints’—spirits that haunt a place. The bottle trees are thought to protect people and their homes from calamities. Maybe all the pent-up bottle djinn in the New Orleans area had been released by Katrina. 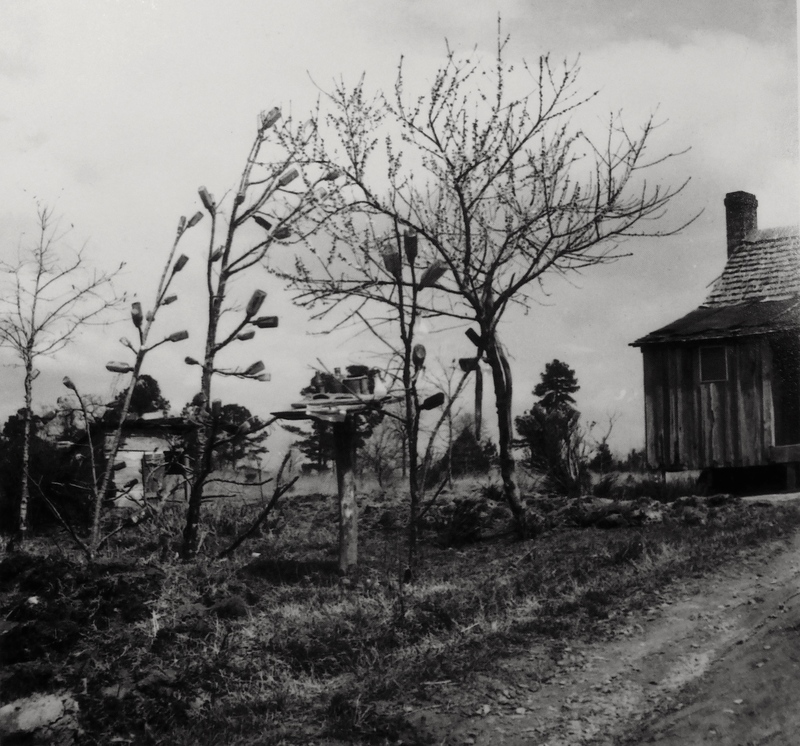 House with bottle-trees/Simpson County/1941/ Eudora Welty. From Eudora Welty Photographs, University Press of Mississippi, Jackson, 1989. The “Message of Remembrances” (notice the singular ‘message’ in the title) was next to the official entrance to the Katrina exhibit, with a large sign stating “Resilience.” Oh no, here we go with the official scripted, up-with-people resilience narrative, I thought, as I entered the darkened room. ‘Resilience’ is an oft-used and ill-used term. ‘Bad things happen to good people, but what doesn’t break you makes you stronger.’ I am highly suspicious of resilience and any context within which resilience is mentioned. I put it in the same category with all those ‘redemptive’ novels according to Oprah: catharsis equals a nauseatingly Hallmark Moment. But, okay, I will attempt to suspend my critical stance and give this museum exhibit on Katrina an honest chance, I told myself. As I snaked my way through the rooms of the exhibit, I found quite a lot to admire in how the curators had chosen to ‘tell the story’ of Katrina. The first few rooms were dark and immersive, showing billowing smoke from one New Orleans building, next to a display of an ax stored in the attic of a ‘mock’ house (an essential home safety precaution that I didn’t know about–many people in Katrina got trapped inside their attics in the rising water and drowned because they couldn’t cut an escape route through their roofs). Then I entered the second room of the exhibit, filled with separate displays on ‘ordinary heroes’ (what is an extraordinary hero–Wonder Woman? ), hospitals, First Responders, seats from the Superdome (fiasco), samples of emergency cans of water from the Red Cross, and MREs (Meals, Ready to Eat that included little bottles of Tabasco hot-sauce). There was a brief and somewhat sanitized display labeled “Race, Class, and Inequality” with a heavily edited quote from then President George W. Bush. This second room was filled with random flashing lights of red, yellow, and that freaky blue again, echoing the bottle display. There was quite a lot of content on the effects of climate change, environmental degradation, and engineering mistakes that all compounded the devastation of Hurricane Katrina. Audio-recordings of Katrina survivors played on an endless loop. An African American man, a former resident of the most severely affected Ninth Ward had this to say: “The water in the vast area matched the speed of a second hand of a clock—that was the amount of time it took for that water to rise. I don’t remember hearing it before: a sound like a freight train.” I found his first person testimony both eloquent and haunting, and I listened to the loop several times to make sure I wrote down his exact words. 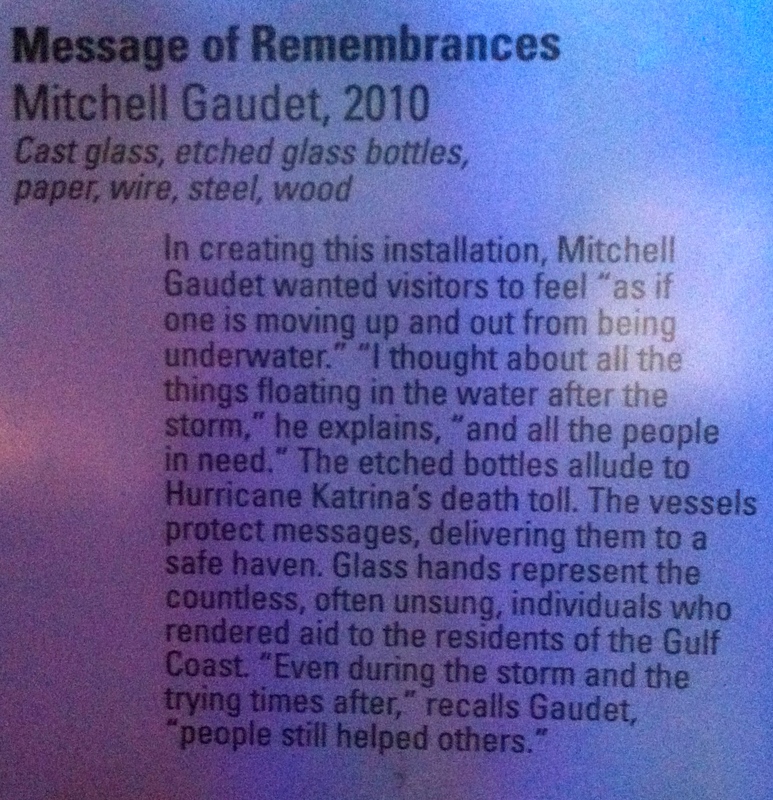 But one section of the Katrina exhibit has continued to bother me. It takes up the most space in the middle-part of the exhibit, being eight or nine panels, sections of the actual walls in a central New Orleans housing project apartment. 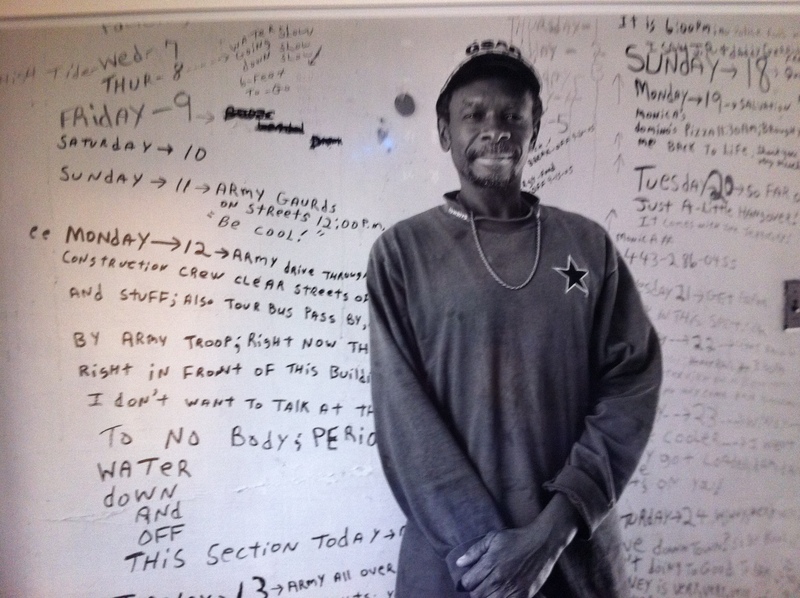 The walls preserve the ‘wall diary’ of Tommie Elton Mabry, a 53 year old man (shown in photo below in front of his wall diary/ ‘ledger or graffiti’ as he called it–written with a black Sharpie.) Mabry, who had been homeless ‘since Regan was president,’ stayed in a first-floor apartment in the deserted high-rise B.W. Cooper public housing development in downtown New Orleans. Starting the day before Hurricane Katrina hit New Orleans until two months later when he was forced to leave by the housing authority officials (the building has been torn down). Tommie Elton Mabry in front of his diary of Katrina written on wall of New Orleans Housing Authority building. Photo: Thomas Neff, November 2005. What bothers me about this part of the exhibit is the unacknowledged ethical issues, power dynamics, and inherent racism and classism. Mabry’s diary entries are written in about a fourth or fifth grade level, include frequent f-bombs, and many of the entries focus on him getting drunk or nursing a hangover. These all highlight negative stereotypes of homeless people, and especially of African American poor people. In the photo and in several local newspaper articles (see below), Mabry appears to be proud of the fact that his diary is now on permanent display in a museum. But did anyone bother to ask his permission before they preserved his ‘wall diaries?’ Did anyone consider setting up some sort of appropriate payment–or housing fund– for use of his words? Tommie Elton Mabry died of a heart attack in 2013, at the age of 58. He was still homeless and couch-surfing at the time of his death. “After Hurricane Katrina struck, Elton Mabry used writing as a way to survive the storm” by Maria C. Montoya. The Times-Picayune, August 23, 2008. “The diary of Tommie Elton Mabry” (video). The Times-Picayune, September 1, 2010. “Hurricane Katrina survivor and chronicler Tommie Mabry dies at 58” by Elizabeth Mullener. The Times-Picayune, February 1, 2013. “Jungleland: The Lower Ninth Ward in New Orleans gives new meaning to ‘urban growth,” by Nathanial Rich. NYT, March 21, 2012. 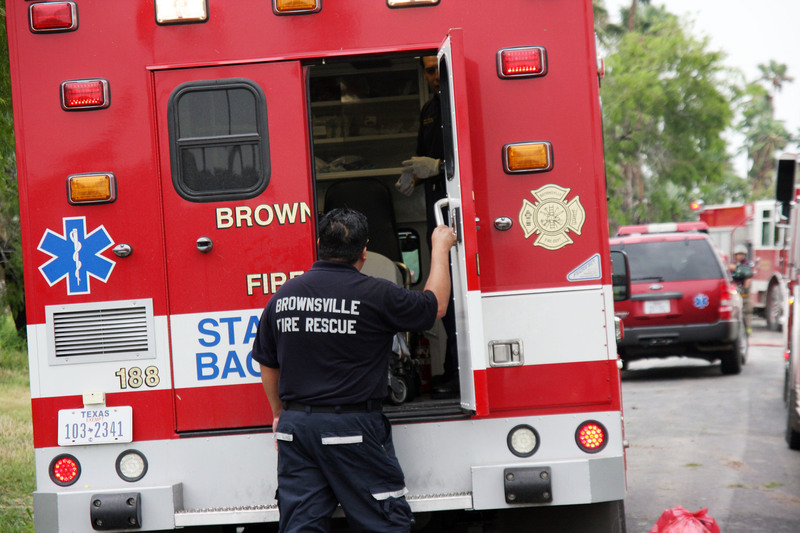 We’re used to hearing the term ‘first responders’ whenever there’s any news coverage or conversations about disaster/emergency preparedness, response, and recovery efforts. And we’re used to seeing images (like the one below) of the typical types of official first responder personnel and their equipment: firefighters, police officers, EMS, Search and Rescue, etc. This past year I’ve become more aware of the importance of cultural and spiritual first responders, especially in terms of the resilience of communities. Spiritual first responders we may think of as only pastors, priests, imams, and other religious leaders. These people are important sources of solace and ethical guidance. But the cultural and spiritual first responders I’m referring to are the artists and writers within communities who aid in our attempt to make meaning out of catastrophe and chaos, to find ways to not only survive but also thrive in the midst of adversity. 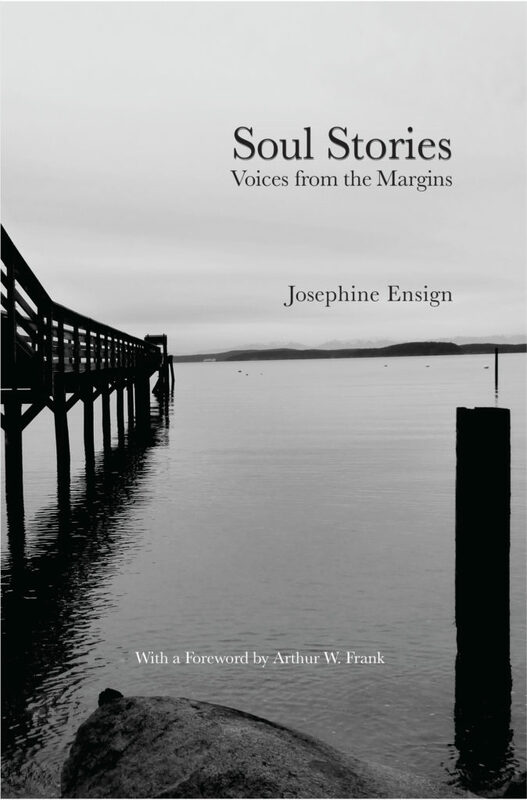 They point the way to healing, to the alchemy of remembrance and forgiveness, to resilience. I’m currently writing an essay ‘Bearing Witness’ about these cultural and spiritual first responders, and about the sticky ethics of witnessing. In the spirit of Thanksgiving, I want to share with you some photos I’ve taken (within the past year) of powerful public artwork in response to the Christchurch earthquakes and ongoing recovery. I am very thankful for the inspiration, perspective and meaning-making they have provided for me. I include the artist’s name when I’ve been able to establish who they are. These are in addition to ones I shared in a previous blog post “Bounce Back” (February 7, 2014) when I was living and working in New Zealand. 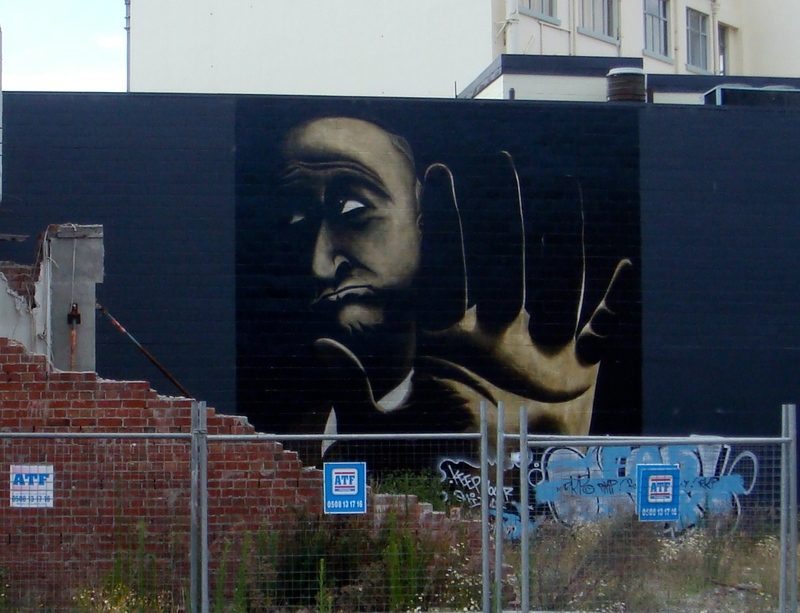 I believe this street art mural on the side of a partially-demolished building in downtown Christchurch was part of Canterbury Museum’s ‘Big Walls’ street art project. I haven’t been able to discover who the artist is but I love this arresting piece. Is the hand held up to stop you from coming too close into the danger zone? Is it calling on you to halt your strange disaster walkabout and reflect on what you are seeing, on what you are doing here? 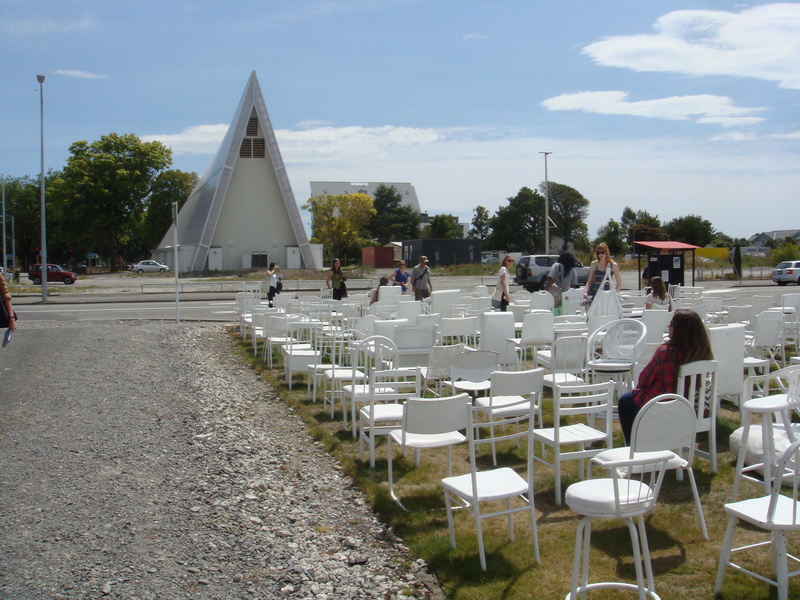 Peter Majendie’s ‘temporary’ installation “185 Chair Memorial” set up in an empty lot in downtown Christchurch, on land where there had been a Baptist Church before the earthquakes destroyed it. (The A-frame white building in the background of this photo is the gorgeous “Cardboard Cathedral” by Japanese architect Shigeru Ban.) Majendie’s original title for his chair installation was “Reflection of Loss of Lives, Livelihood and Living in Neighborhood” and was initially set up in February 2012 for a week to mark the first anniversary of the most devastating Christchurch earthquake. Each of the 185 white-painted chairs represents a person killed by the earthquake. There are desk chairs, bar stools, lawn chairs, stuffed lounge chairs, folding chairs, rocking chairs, children’s chairs, director’s canvas chairs, infant car seats, infant highchairs, and wheelchairs. The sign encourages people to sit quietly in a chair to which they are drawn. “The installation is temporary—as is life,” the artist states. Love this one! “Weaveorama” is an interactive street art installation by textile artist Hannah Hutchinson. 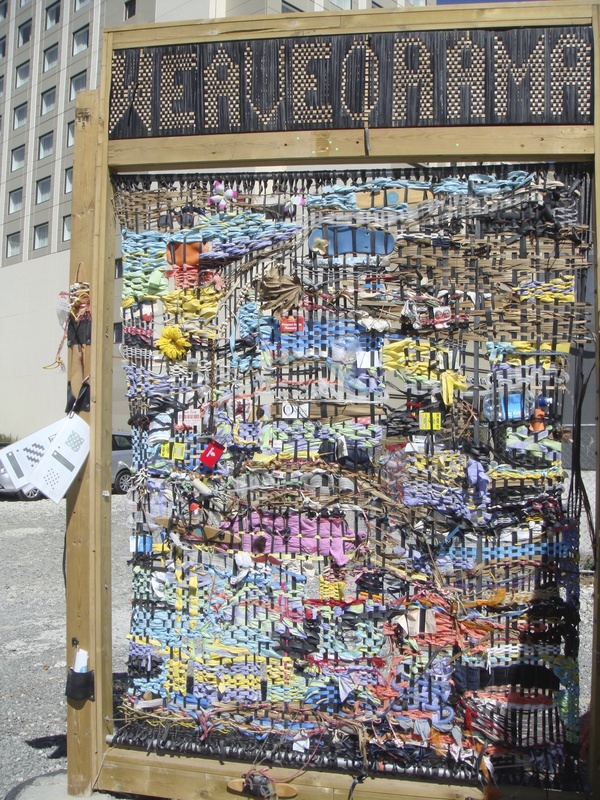 Part of the Gap Filler project in Christchurch, it is a giant public loom with a sign that says “join with us in creating a new city fabric” and encouraging people to add their found or recycled objects. I especially loved the addition of the pink satin bra. Finding a place for appropriate humor and whimsy is important for individual and community resilience.